The history of Singapore Michigan is a truly fantastic story of a frontier boomtown gone bust. Born on the dune lands of the southeastern shores of Lake Michigan, the once prosperous city of Singapore would eventually be swallowed by the vengeful sands. This area near Saugatuck was first settled around 1830. This was when President Andrew Jackson's Indian Removal Act went into effect and the Ottawa people began moving out. By 1836, when the Ottawa and Chippewa ceded their territory in the Treaty of Washington, the area was open for commercial exploitation. It was in December 1836 that a New York land speculator, Oshea Wilder, purchased the area with the intention of building a port city as big as Chicago. At the height of its prosperity, Singapore consisted of saw mills, hotels, general stores, a bank, and a schoolhouse. During this time the town consisted of 23 buildings and two sawmills. The school in Singapore has been called "Michigan's first schoolhouse" and if true it would be a note worthy addition to its history. Considering the first forts in Michigan were built in the late 1600s, it couldn't possibly be the first school ever built in Michigan. Proving it was the first school built in 1836, when Michigan became a state, would be highly improbable (no building permits back then), and so it is doubtful that it could be verified as the first. The Singapore bank was what can be called a "wildcat bank" and had a colorful history worthy of any B western movie. Below is a quote from source Jack Buist who taught history at Allegan High School. "By 1838, over $50,000 in Singapore Bank notes had been placed in circulation. Shortly after the Civil War, Singapore was involved in a bank scandal. State banks were required to maintain enough hard currency on hand to cover at least 1/3 of the banknotes that were circulating, and neither Singapore nor Allegan was at that level. Allegan State Bank would receive warning from nearby towns that the bank inspector was coming through. They would arrange for all the money from Singapore State Bank to be transferred to Allegan State Bank. After the inspection, the banker in Allegan would take the bank inspector out and get him drunk. While he slept it off, they would get a head start on him and take all the money from Allegan to Singapore State Bank in time to pass the inspection there." Another interesting story from Singapore's history is the forty day blizzard of 1842. The snowstorm was so intense and long lasting that it nearly wiped out the town. However, good fortune was with the citizen's of Singapore because a boat named the Milwaukee, loaded with food, shipwrecked right on the town's shore. The food that ship carried fed the people of Singapore until the blizzard blew over. Lucky to be able to dig out after that storm, Singapore would have no such luck with the storm to come. Business grew as lumber from Singapore sawmills was shipped to Chicago over Lake Michigan. The town was thriving and had a population of several hundred people by 1871. It was that year the great Chicago fire occurred and created a huge demand for lumber needed in the rebuilding effort. Singapore was happy to supply that demand until they completely deforested the area. 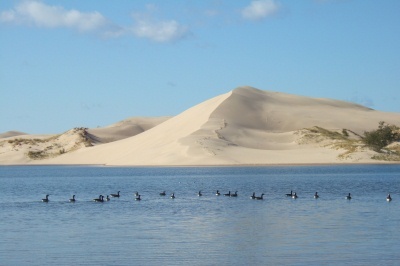 Without trees, strong Lake Michigan winds caused massive erosion and shifting sand dunes that created fatal problems for the town. Within four years sand had completely covered the once vibrant boomtown. Singapore's last occupant refused to move, even after the sand piled so high he had to enter his home by a second story window. He stayed until around 1875 when the sand reached the roof. I find this to be a story in the same league with epic legends and myths. Like the story of the lost city of Atlantis, Singapore was blessed with bountiful resources and prosperity, only to become corrupt and greedy. Having been once favored by the gods, the town now brought their scorn and were punished by an all consuming natural disaster that swallowed it into the depths of the earth. There's an abandoned building in Croton that I have heard was once a hunting club during prohibition. I've driven around it a number of times and the architecture is like an old hunting lodge with those steep, sharp peaked, roofs. However, with large doors on one side, it could have been a carriage house for a residence that no longer exists. The story I heard claims that they had illegal booze there and that it was one of Al Capone's hideouts. I was told he would fly up the river in a pontoon plane, land on Croton pond and stay there before moving on. My research has shown that there is a good chance that this story could be true. I'll have to find out if this building actually was part of a hunting lodge that was established around 1920 and that it continued to do business until Capone was sent to jail in 1931. I will do some library research for a follow-up. For now, judging by look of the building, it could be that old, and I'll assume for the moment that this was at least a remnant of a lodge in Croton from that era. I have found three main points that support the possibility that Al Capone was a guest in Croton. Those points are that Croton was within Capone's territory of operation, he had a habit of traveling to hidden retreats, and there is documentation that he has visited such retreats in Michigan. In 1919 Michigan ratified the 18th Amendment to end liquor sales and that's when Detroit gangs began bootlegging liquor from Canada. One estimate says that during prohibition, 75% of liquor smuggled into the U.S. came from Canada through Detroit. By 1925 Capone worked his way up the ranks and became the head of the Chicago mob. Around this time the Purple Gang in Detroit had consolidated power and dominated the Canadian connection. The Purple Gang was so ruthless that Capone would rather buy black market booze from them than trespass into their territory. Capone apparently had an agreement to stay out of eastern Michigan. He went for retreats as far east as Lansing, so the idea that Michigan was split in half, with Capone's territory as the west half seems reasonable. Well west of Lansing, Croton would be an easy stop along the east shore of lake Michigan while flying to more northerly destinations. Concerning the floatplane, although not popular until 1937, planes with pontoon landing gear have been around since WWI. Such planes were not easily available between 1920 and 1931 as production was limited and most were for military or government use. Of course a wealthy and connected gangster would be able to afford passage aboard such a plane. There was at least one property in Escanaba Michigan owned by Al Capone but many of his safe houses were in other people's names. Beside going to hotels and restaurants like anyone else, he would also visit his business associates where he was a welcomed guest. Apparently he was a fan of Muskegon High School's football team, the Big Reds. One source claims he had gone to a few games and would keep track of their scores. Another report claims that Al Capone and other mobsters gambled in the basement of one of Newaygo's hotels. The city of Muskegon would be a good stopping point before heading upstream to take care of business in Newaygo and Croton. Other supposed hideouts in Michigan were in Leland, Glen Arbor, Northport Point, North Fox Island, and Berrien Springs. The hideout in Leland apparently had a guard tower much like his lodge in northern Wisconsin. The Wisconsin lodge was on 407 acres with a 37-acre private lake, an eight-car garage and a guard tower. Capone was frequently leaving Chicago when the heat was on and stories of places he stayed are as numerous as those of George Washington. A good example of how he would leave town when there was trouble is when he spent the entire summer in Lansing just before he was indicted in the fall of 1931. Although I have no evidence that Al Capone had visited Croton, it is possible he did considering, he had many wooded retreats north of Chicago, Croton was in his territory, and he visited as close as Muskegon and possibly Newaygo.